With its stunning, polished-metal openwork, this “Butterfly” Silver-Metal Bookmark rises a step above elegance. The pure-white silk tassel simply adds to the remarkable beauty of a gift your guests will use and treasure always. Designed to create a butterfly “garden” at your wedding reception, bridal shower, Quinceanera or Sweet 16 celebration, the butterfly bookmark is delightfully presented in a display gift box adorned with cheery flowers in pastel shades of pink, blue and lilac with light-green accents. A white, grosgrain ribbon and bow with matching, flower-shaped “For You” tag complete the gift for presentation. 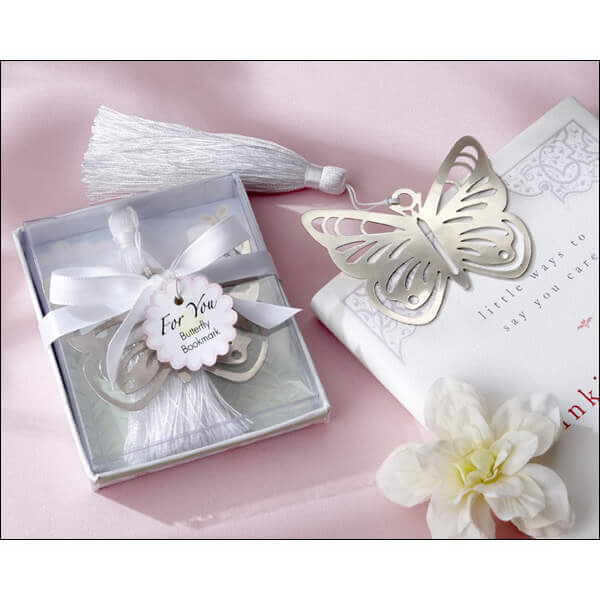 The butterfly bookmark measures 5.2cm h x 5.7cm w with a 8.9cm tassel, and the gift box measures 8.9cm by 7.6cm by 1.9cm. Hey Emma, thank you sooooo much the chocolates looked amazing!!!!!! Thank you sooo much. The guests loved them and so did we. You are highly recommended and will always pass your details to others.